Subscribe to our Youtube Channel for more SEO techniques you can implement from Home. 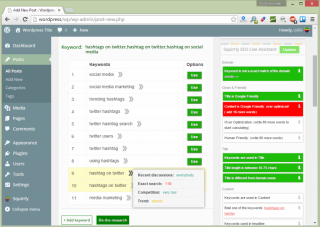 Squirrly’s Keyword Research and Analysis tool helps you find keywords that are trending, that people are currently searching for, and that will ultimately get you more visibility online. It’s very important to be found online by the right keywords, because it will bring you targeted visitors. These are the people that are interested in what you have to offer. The Keyword Research tool helps you find long tail keywords that are easier to rank for, especially if you just started your own business and you want fast results. The tool looks at your competitor’s keywords, and it will grab the best ones for your articles.